The U.S. government has ordered Qualcomm Inc. (NASDAQ: QCOM) to delay its annual shareholder meeting by 30 days to give the Committee on Foreign Investment in the U.S. time to review Broadcom Ltd.’s proposed $117 billion takeover bid. The move effectively postponed a key shareholder vote that could have potentially given Broadcom more influence on Qualcomm’s business. Qualcomm said the shareholder vote would now be delayed until April 5. The government took actions on the grounds that the deal could endanger the country’s technological prowess and national security. CFIUS usually reviews attempts by foreign entities to buy controlling stakes in U.S. companies. The proposed merger is the technology industry’s biggest potential takeover. Qualcomm is a leading developer of technology and patents for 5G, the next-generation wireless technology. A CFIUS official wrote in a March 5 letter to the companies’ lawyers that “a shift to Chinese dominance in 5G would have substantial negative national security consequences for the United States.” Qualcomm also does sensitive work for the U.S. government. In late February, Rep. Duncan Hunter (R., Calif.) called the deal a “disaster for national security”. CFIUS wants to make sure Qualcomm does not lose its status as a dominant player in wireless chip technology. The panel has blocked several attempts by Chinese technology companies to acquire U.S. chipmakers over the last 12 months. Broadcom is not a Chinese company, but many of Qualcomm’s rivals, including Huawei Technologies, are Chinese. Qualcomm shareholders were set to vote on whether six of the company’s 11 directors would be replaced with nominees put forward by Broadcom. Broadcom said it would cooperate with the CFIUS review. In a statement, Broadcom said it has responded to the CFIUS inquiries about the company’s nomination of directors to Qualcomm’s board. During a televised appearance last November with President Donald Trump at the White House, Broadcom Chief Executive Hock Tan announced plans to redomicile the Singapore-based company to the U.S. Mr. Trump praised Mr. Tan during the appearance, calling him “a great, great executive” and calling Broadcom “one of the really great, great companies.” Mr. Tan launched an unsolicited $105 billion bid for Qualcomm days later. Qualcomm has thus far rejected Broadcom’s advances. 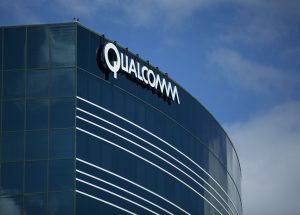 Qualcomm reportedly asked CFIUS to review the bid. Broadcom said Qualcomm filed the request without informing Broadcom or its own shareholders. CFIUS skipped a typical 30-day preliminary assessment period and said it was starting an accelerated review of the potential deal.